A Girl Worth Fighting For? What kind of expectations do we place on ourselves? How about what we expect of others? Are they true and real ones, or are they more often based in fantasy or unreality? The song is charming, expressing the longings of men heading into a dangerous situation, who only want to know what they are about to face is worth it for someone back home. They express their hopes and dreams of what each believe is their ideal female, and how much they want the presence of these ladies in their lives when they go home. In the second movie, the song is taken further, by heroes come home who still don’t have the women of their dreams by their sides. At first, I listened to the music and just enjoyed it. It speaks of what Wild At Heart by John Eldredge details. It says how all men really want is a battle to fight, a beauty to rescue and to be a hero. As a woman, I find these concepts somewhat foreign, but I’ve studied enough on the differences between men and women to understand these compelling needs. After all, as a woman, I find myself often yearning to be the beauty to be rescued, to nurture my hero and guard and care for the helpless, particularly those closest to me. The problem came as I thought more about the song. Because as I did, I started to change the lyrics. I started to make them personal. Instead of a man wanting a girl worth fighting for, I wanted to be that girl worth fighting for. I started to think of whether or not I was worth fighting for, if I wasn’t slender enough, pretty enough, smart enough or just enough of whatever. I started to wonder if I was too much of whatever. I started to think the expectations of the lyrics to be a girl worth fighting for were on me. It was then I realized I was giving in (yet again!) to our culture’s domineering critical nature against women, and my own self-doubts and fears I battle daily. I next realized as a daughter of God, a born-again Blood of Christ covered repentant sinner, I am enough! I am enough in the sight of God, and if HE says I am enough, it ends the matter. The problem next happened that I started to put it on my poor long-suffering spouse. Now, instead of thinking why I couldn’t be a girl worth fighting for if there wasn’t a problem with him seeing me as a girl worth fighting for. So I started ladling unrealistic expectations on him, instead. I wanted him to be instantly something he is not, instead of who he wonderfully is and allowing him the same process he allows me daily to change and grow. How often we put unrealistic expectations on ourselves and others, instead of simply realizing we’re all a work in progress and being patient with everyone’s process, including our own!! It’s so subtle and sneaky, too! I thought I had it beaten, but then this darn song went and proved me oh, so wrong, giving me yet another opportunity to repent, change and grow. As I realize what happened and what I did to both of us, I feel so absurd. But then, that’s what unrealistic expectations are, really. They’re absurd, and the sooner we recognize them for what they are, the happier we’ll all be. Now, I need to go watch another movie and find a new song, so I can get this dratted one out of my head!! What is Heaven like? I remember asking that question as a child. I suspect if we were raised in any kind of religious home, or had any experience with the death of a loved one at a young age, most of us asked it at one point or another when we were children. For the most part, unfortunately, I think it went largely unanswered, or insufficiently answered. I know it did for me. 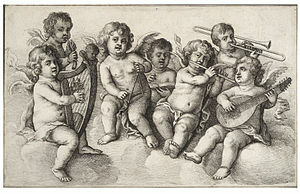 Somehow, the picture that springs to mind, largely fueled by the media, of cherubs fluttering around with harps and lounging on clouds, is at best unsatisfying. At worst, it seems patronizing and trite. So, what is Heaven like? It’s a subject preachers don’t often mention, because they don’t have a lot to go on, save for the words of Jesus and the visions of prophets like John in Revelation, Ezekiel and Isaiah. Jesus gave us analogies, mostly picturing what He wanted His Church to be like. Jesus’ word pictures were largely centered in people’s relationships to one another and to His Father. John, Ezekiel and Isaiah spoke of when the world finally ends, and what will happen. Though if you ask Bible scholars of differing theologies, you will get at least 4 or 5 different interpretations of what they said. This ends up being confusing at best. Preachers don’t often mention it in sermons also because most Westerners don’t want to face the inevitability we will all eventually die. We are often perpetually self-deluded individuals, who act as if we will live forever, when we know at heart we will not. We find the topic of death uncomfortable, and put off discussions about it. This can also lead to eternal damnation for those who do not face it and acknowledge Jesus Christ as Savior and Lord in the here and now. So, what is Heaven like? I heard someone speak once about music and worship, and what he believed it would be like in Heaven for those who believe in Jesus as Savior. He said everyone who wrote music to praise God would sing it before Him, with everyone else listening. All the different music styles, languages and cultures throughout the ages would give their music in a huge concert of praise to God. He also said all the different cultures through the ages would bring before God what made them special, what God put in them to be unique. Tribal dances, animals, costumes and patterns, music and traditions would create a gigantic parade of splendor. Folks from Africa might come with lions, zebras and gazelles, dancing and singing. Folks from China might come with pandas and silks. Folks from India would bring elephants and tigers. All the wealth of every nation and diverse cultures would be on display, all for the glory of God. I think about it, and am reminded of the scene from the movie “The Ten Commandments,” when the wealth of Egypt’s subject peoples were brought in tribute to Pharaoh. It would be like that, only on a far grander, vastly more epic scale than our human minds can comprehend. Talk about your concerts of praise! I was reminded of all this when I saw a video on FaceBook this week. It is Christian singer/songwriter Chris Tomlin, singing his popular worship song, “How Great Is Our God.” In the video, he is joined by church worship leaders from around the world, singing in Spanish, Chinese, Swahili and other languages. They were all singing the same song in their own languages, sometimes at the same time. The joyful rendition reminds me of that picture of Heaven I was taught, which is the best description of it I’ve heard so far. Here’s the link. I hope you enjoy it as much as I have. And, if you are not someone who has acknowledged Jesus Christ as Lord and Savior of your own life, I invite you to do it now. Heaven eventually awaits those who follow Him, and He gives a full and complete life to them in the here and now as well. If you do, please let me know in the Comments section. I will keep it private, and I will do what I can to link you to a local church in your area, where you can grow in your new faith. Have you ever gotten way out of your comfort zone? What’s it like for you, to try something new? How do you feel when you do something you’ve never done before? A couple of days ago, I learned our local minor league baseball team, the Tri-City Valley Cats, were holding open auditions for people to sing The Star Spangled Banner at their home games this season. I have been told I am a good singer, so I figured, why not? The worst I could do was not be chosen, and perhaps be a little embarrassed in front of a few judges and a couple of other contestants. Little did I know. The larger of our local malls was packed with Saturday shoppers. There were over 50 contestants, and more arriving as I finished, at number 44. All of the others had friends and family along for moral support. I had me. My husband was on his way home from a visit with his family in Maryland, our kids couldn’t come, and our friends had other commitments. There was a cameraman from one of the local network affiliates, who filmed some of the contestants. I breathed a sigh of relief when he left! Unfortunately, the photographer from one of the local papers arrived right after he left, and she stayed. My photo was chosen for one on the front page its Sunday local section, and is now in a slide show on its website. I have my eyes closed in the photo because they were closed the whole time I sang. I was concentrating on the tempo, the music and getting the words out properly. They had us singing it a-capella (that’s with no backup music, for the uninitiated), and it’s not an easy thing to sing, especially without backup. In my opinion, it is, by far, the least flattering photo taken of me in my entire life!! Thankfully, the folks at church hadn’t seen it before services Sunday. Unfortunately, the nurse at my doctor’s office Monday morning and about 1/2 of my coworkers have. I had it mentioned to me all Monday, and learned they will be posting a print of the website photo to the department bulletin board after our monthly staff meeting Friday. Oh, my goodness, what a fuss! Getting outside the box is not easy. I was nervous, I’ll admit it. I’ve sung in front of larger crowds. I just always had moral support someplace, and backup music. It was never just me and my voice. But I did it. And if I did it, that means you can get out of your boxes, too. P.S. I heard from the judges a few days later. I was not chosen for the next round.